There are books that you know that you are going to love, then there are books that you expect the worst from but totally take you by surprise. Pivot Point was definitely the latter.Addison Coleman is a searcher. A person who can look into the future to see what outcome a certain choice will bring. Should she go out with the cute boy from her class? By taking a quick peak into her future she can see what happens if she say yes. When Addie discovers that her parents are getting a divorce, Addie knows that deciding which parent to live with is not an easy choice, and knows that her talent will enable her to make the right decision.Pivot Point looked to be a contempory with the little twist. For the most part, it was. There is a definite emphasis on the kid's talents inside the Compound, and its backstory. However, if you are looking for a supernatural read, Pivot Point really doesn't deliver in that regard. Did the lack of supernatural elements throughout effect how I felt about Pivot Point? Yes, but in the best possible way. Instead of wondering about every little detail due to the talent defining Addie, I was able to focus more everything else: the other characters, the romance, the family dyamic.At its heart, there is so much depth to Pivot Point. I absolutely loved this read to pieces. Told through two different Addies, I guess you could say, it was really interesting to see how one decision can change you as a person. While Addie with her mom and Addie with her dad were basically the same Addie, but there were apparent differences between the two. But with both, I throughly enjoyed getting to see the depth of Addie's character. If I have had to make one complaint, it would be that it took me a while to figure out when Pivot Point had moved into the alternative futures. Just a hint: It tells you in the chapter titles.Final Verdict:Pivot Point hands down is probably the most surprising read for 2013. Going in, I thought I might like it, but definitely had some reservations. By the end of Pivot Point, I was an emotional wreck, and loved it so much I was ready to start reading it again. From a heart stopping romance to fantastic characters throughout, Pivot Point is one read you cannot ignore.Will I read the next installment?Although Pivot Point seems pretty straight forward, there is a bit of a promise for more with that ending. Personally, I like the ending the way it was, BUT really, really wanted to see what would happen next. 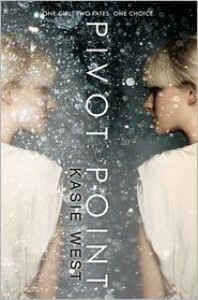 I loved Pivot Point so much that I cannot imagine skipping the sequel or anything else that Kasie West comes up with. She has a reader for life in me.